Farmington Hills, MI : Thomson Gale, 2006. 100 ME:PersonalName 1_ $a Personal name Hay, Jeff, editor. 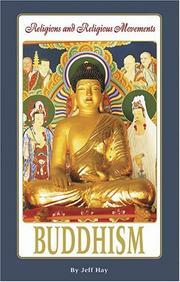 245 Title 10 $a Title Buddhism. 300 Physical Desc __ $a Extent 238p . : 22cm. 541 Acq Source Note __ $d Date of acquisition 2007/03/20. 650 Subj:Topic __ $a Topical term Buddhism.